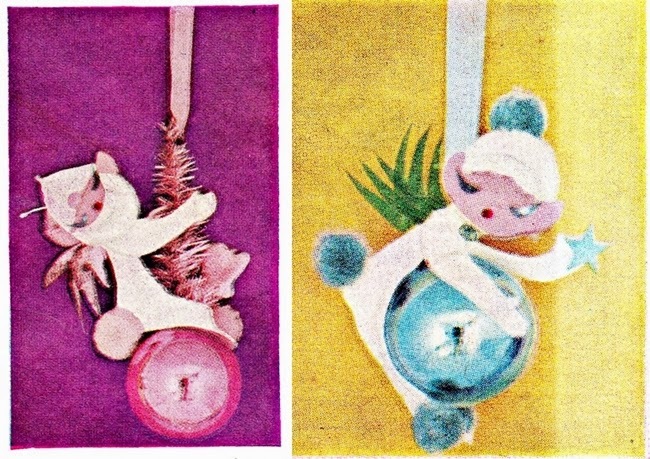 Last year, I made these 1958 mischievous pixie ornaments from a vintage magazine.They turned out so cute and are now some of my favorite holiday decorations. 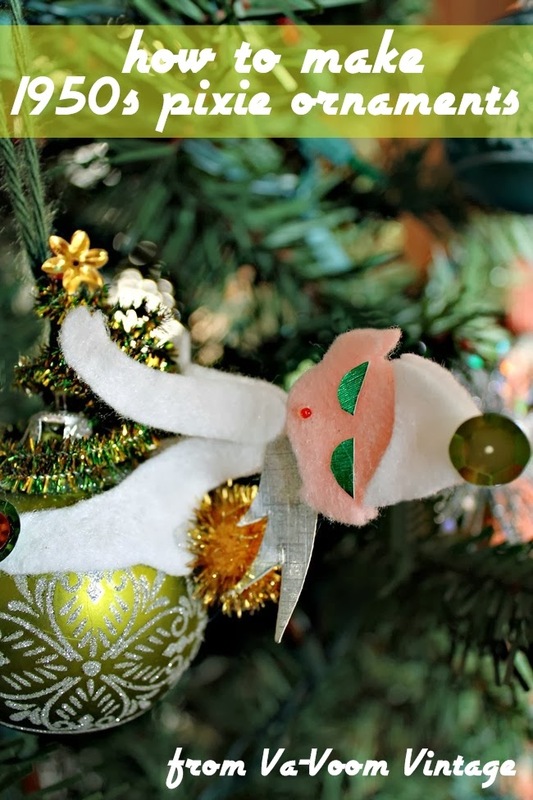 This is a fun project that the kids can help with and they match beautifully with your other retro Christmas kitsch. ball ornaments- I used plastic modern ones. I love unbreakables with little ones around! other bits such as spangles, sequins, tiny foil or bottle brush trees. If you have a hard time finding trees, I found some green foil cocktail picks at the craft store and when you snip them short, they're great little trees! You can also curl metallic pipe cleaners into spirals to make a tree. if you do this, hot glue the ribbon to the ball and pull the ribbon up through the center of the spiral tree, as pictured. I hope that you and your family enjoy making memories with these funny mid-century sprites! Stay tuned later this week for more vintage Christmas DIY projects! Brittany these are DARLING. I am so making these this weekend!! These are so stinkin' cute! I want a whole tree of these now. Thanks for sharing. These are so splendidly cute! I could see myself whipping up some in the future to use on handmade Christmas cards, too. Oodles of thanks for sharing this great holiday how-to, honey! They are so gorgeous and so many lovely details in them. Oh my gosh, those are simply adorable!! I have to find some time to make those before Christmas. What a great tutorial, thank you! What gorgeous ornaments! I love them!